Justin Hargett busted out of a miserable day at the plate (previously being 0-3 with 2 Ks already) to blast a 2 run HR and lift Auburn to a 5-3 win in the series opener. Grant Dayton was solid (7 innings , 1 ER, 5 H, 7 K) and the only blemish pitching-wise was Michael Hurst who came in to start the 8th. Hurst allowed back to back singles to open the door back up for Elon. To be fair, Hurst was the victim of a costly error at 3rd by Joseph Sanders (and a potential double-play), that allowed Elon to tie the game. 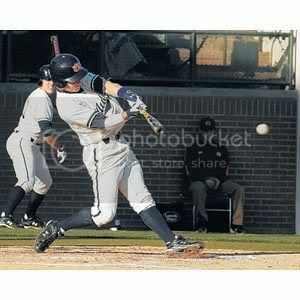 -Freshman Casey McElroy, starting at SS, was 2 for 2 on the day, with a walk. Not a bad way to start a career. -Brian Fletcher's 2 for 4 day, scoring 2 runs as well. -Being unable to contain Elon's All Everything tandem of Cory Harrilchak and Chase Austin. Both players were 2 for 4 with Harrilchak providing the 8th innning spark to get the Phoenix back in the game.